was born in Miami, Florida. The grandson of famed South Beach Art Deco architect Roy France, Greg carries the instinct for artistic form & function in his blood. The opportunity to build a palapa structure drew him to the Florida Panhandle’s SoWal community in the mid 80’s. Greg is well known for his exuberant consumption of life, delight in fishing, loyalty to friends, and colorful independent character. Diverse life adventures range from flying choppers in ‘Nam, to remodeling the London recording studio of an internationally famous keyboard musician, to operating Seagrove’s Island Grill, with more recent recognition for the many homes he’s built in the Point Washington, Seagrove, & Seacrest neighborhoods of SoWal. Artistic trim details mark Greg France built homes. grew up milking cows on a dairy farm near Topeka, Kansas. Her artistic passions surfaced at a young age (often driving her Dad nuts with her penchant for covering everything including his professional papers with drawings of sinewy belly dancers). With aspirations of becoming a fashion designer, sketching & painting provided fanciful flight from farm realities. Striking out for New York City’s 7th Avenue and the international world of fashion honed Donna’s design talents, business acumen, & sense of adventure. SoWal’s beautiful beaches, eclectic community & gracious Southern style drew her to Florida. to the seawall of the new home she was building. “I gotta meet this chick… she works harder and stronger than a lot of men I know” he thought to himself. 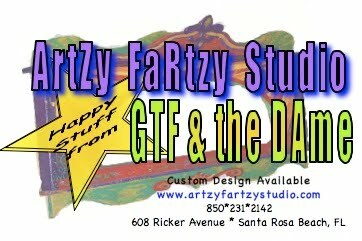 co-creating HAPPY STUFF in their ARTZY FARTZY Garage Studio!